Why animals sleep remains one of the enduring mysteries of biology, but new research suggests the primary reason might be to allow cerebrospinal fluid to wash all the gunk out from between your brain cells. Sleep seems to strengthen links between cells, helping turn short-term memories into long-term ones. But scientists have struggled to understand how such a system might have evolved – you need a pretty damn good evolutionary reason to lapse into unconsciousness for several hours every day in a world full of hungry predators, and it's not clear that making memories is good enough. A team of researchers at the University of Rochester Medical Center weren't necessarily trying to explain sleep when they peered into the brains of mice earlier this year. Their research involved the glymphatic system, which suffuses the brain with cerebrospinal fluid, and their semi-accidental discovery only happened because they'd trained their test subjects so well. The mice were trained to hang out under a microscope while the researchers probed their brains, and some of the mice were so chill about the whole thing they actually fell asleep. That's when the team noticed a big difference between the brain of an awake mouse and the brain of a sleeping mouse. Awake mouse? Dry brain. Sleeping mouse? "It was almost like you opened a faucet," lead researcher Maiken Nedergaard told Science News. It is known that "junk" (mostly fragments of proteins and other cellular detritus) accumulates between brain cells during an animal's waking hours, and that less junk is around after a period of sleep. The exact mechanism hasn't been well-understood, but Nedergaard's team may have found it. 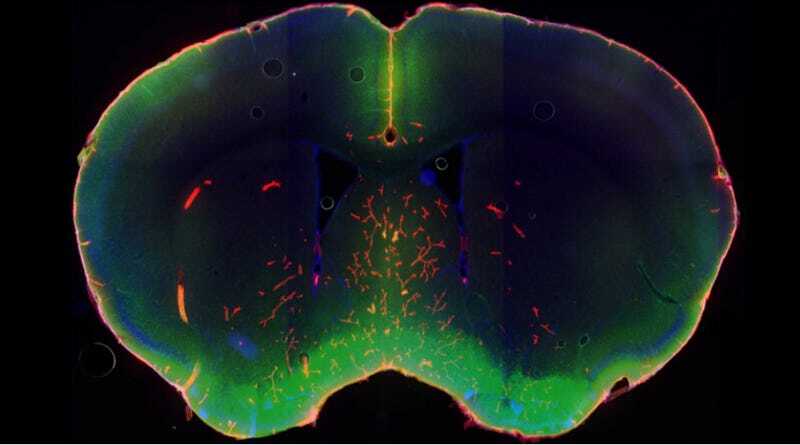 They noticed that glial cells in the brain shrink when a mouse is asleep, increasing the interstitial space between brain cells by as much as 60%. This allows cerebrospinal fluid to rush in and wash away all the garbage molecules. Some of those stray protein chunks contribute to neurodegenerative disease, so the finding might lead to new avenues of research in the search for cures. It also might be a more compelling evolutionary reason for sleep to exist at all – memory reinforcement might just be a beneficial side effect. Imagine a drug that triggers a quick glial shrinkage/cerebrospinal flush response. Insta-sleep! Or a bio-engineered super soldier whose brain clears away the junk proteins constantly, so he never needs to sleep. Source: Hesman Saey, Tina. "Sleep allows brain to wash out junk." Science News, October 17th, 2013. Photo: L. Xie, H. Kang and M. Nedergaard.